A novel about a young man on the cusp of adulthood and a woman who has long been there, a love story shot through with sheer beauty, profound sadness, and deep truth. One summer in the sixties, in a staid suburb south of London, Paul comes home from university, aged nineteen, and is urged by his mother to join the tennis club. In the mixed-doubles tournament he's partnered with Susan Macleod, a fine player who's forty-eight, confident, ironic, and married, with two nearly adult daughters. She is also a warm companion, their bond immediate. And they soon, inevitably, are lovers. Clinging to each other as though their lives depend on it, they then set up house in London to escape his parents and the abusive Mr. Mcleod. Decades later, Paul looks back at how they fell in love, how he freed Susan from a sterile marriage, and how - gradually, relentlessly - everything fell apart, and he found himself struggling to understand the intricacy and depth of the human heart. It's a piercing account of helpless devotion, and of how memory can confound us and fail us and surprise us (sometimes all at once), of how, as Paul puts it, "first love fixes a life forever." The information about The Only Story shown above was first featured in "The BookBrowse Review" - BookBrowse's online-magazine that keeps our members abreast of notable and high-profile books publishing in the coming weeks. In most cases, the reviews are necessarily limited to those that were available to us ahead of publication. If you are the publisher or author of this book and feel that the reviews shown do not properly reflect the range of media opinion now available, please send us a message with the mainstream media reviews that you would like to see added. In this wonderful rendition of a young man in love with an older woman Barnes once again does a masterful job. Much like the premise of The Sense of an Ending, we see the older man looking back on his youth. We see how the youth was shaped into a man by the experience of his first love. As he reminisces we see how his perspective changes throughout the years. We see his memory revisit his first love - and how he changes as time and circumstance move forward. 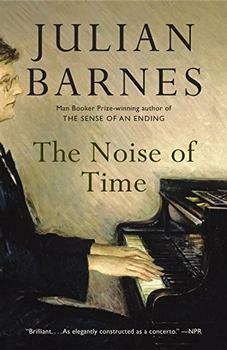 Julian Barnes is an excellent author. His prose is like closing your eyes and letting a mesmerizing melody float you away. You see his characters - you understand his characters - you live along side his characters. The only problem I have with a Julian Barnes novel is the last page. I am always sad when his stories end. Julian Barnes was born in Leicester, England on January 19, 1946. He was educated at the City of London School from 1957 to 1964 and at Magdalen College, Oxford, from which he graduated in modern languages (with honors) in 1968. After graduation, he worked as a lexicographer for the Oxford English Dictionary supplement for three years. In 1977, Barnes began working as a reviewer and literary editor for the New Statesmen and the New Review. From 1979 to 1986 he worked as a television critic, first for the New Statesmen and then for the Observer (London).